The finite element method (FEM) is a computational tool widely used to design and analyse complex structures. Currently, there are a number of different approaches to analysis using the FEM that vary according to the type of structure being analysed: beams and plates may use 1D or 2D approaches, shells and solids 2D or 3D approaches, and methods that work for one structure are typically not optimized to work for another. Finite Element Analysis of Structures Through Unified Formulation deals with the FEM used for the analysis of the mechanics of structures in the case of linear elasticity. 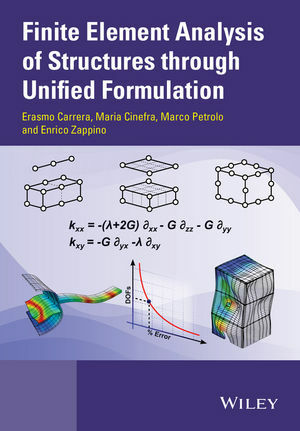 The novelty of this book is that the finite elements (FEs) are formulated on the basis of a class of theories of structures known as the Carrera Unified Formulation (CUF). It formulates 1D, 2D and 3D FEs on the basis of the same 'fundamental nucleus' that comes from geometrical relations and Hooke's law, and presents both 1D and 2D refined FEs that only have displacement variables as in 3D elements. It also covers 1D and 2D FEs that make use of 'real' physical surfaces rather than ’artificial’ mathematical surfaces which are difficult to interface in CAD/CAE software. Finite Element Analysis of Structures Through Unified Formulation is a valuable reference for researchers and practitioners, and is also a useful source of information for graduate students in civil, mechanical and aerospace engineering. Erasmo Carrera is currently a full professor at the Department of Mechanical and Aerospace Engineering at Politecnico di Torino. He is the founder and leader of the MUL2 group at the university, which has acquired a significant international reputation in the field of multilayered structures subjected to multifield loadings, see also www.mul2.com. He has introduced the Unified Formulation, or CUF (Carrera Unified Formulation), as a tool to establish a new framework in which beam, plate and shell theories can be developed for metallic and composite multilayered structures under mechanical, thermal electrical and magnetic loadings. CUF has been applied extensively to both strong and weak forms (FE and meshless solutions). Carrera has been author and co-author of about 500 papers on structural mechanics and aerospace engineering topics. Most of these works have been published in first rate international journals, as well as of two recent books published by J Wiley & Sons. Carrera’s papers have had about 500 citations with h-index=34 (data taken from Scopus). Maria Cinefra is currently a research assistant at the Politecnico di Torino. Since 2010, she has worked as a teaching assistant on the "Non-linear analysis of structures", "Structures for spatial vehicles" and "Fundamentals of structural mechanics" courses. She is currently collaborating with the Department of Mathematics at Pavia University in order to develop a mixed shell finite element based on the Carrera Unified Formulation for the analysis of composite structures. She is currently working in the STEPS regional project, in collaboration with Thales Alenia Space. M. Cinefra is also working on the extension of the shell finite element, based on the CUF, to the analysis of multi-field problems. Marco Petrolo is a Post-Doc fellow at the Politecnico di Torino (Italy). He works in Professor Carrera's research group on various research topics related to the development of refined structural models of composite structures. His research activity is connected to the structural analysis of composite lifting surfaces; refined beam, plate and shell models; component-wise approaches and axiomatic/asymptotic analyses. He is author and coauthor of some 50 publications, including 2 books and 25 articles that have been published in peer-reviewed journals. Marco has recently been appointed Adjunct Professor in Fundamentals of Strength of Materials (BSc in Mechanical Engineering at the Turin Polytechnic University in Tashkent, Uzbekistan). Enrico Zappino is a Ph.D student at the Politecnico di Torino (Italy). He has worked in Professor Erasmo Carrera's research group since 2010. His research activities concern structural analysis using classical and advanced models, multi-field analysis, composite materials and FEM advanced models. He is co-author of many works that have been published in international peer-reviewed journals. Enrico was employed as a research assistant in Professor Erasmo Carrera's group from September 2010 to January 2011, where his research, in cooperation with Tales Alenia Space (TASI), was about the panel flutter phenomena of composite panels in supersonic flows.